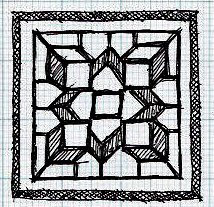 This little doodle was done during my Board meetings last week. I sketched a bunch of little things during the two days of meetings, but I liked this one best. It reminds me of those stained-glass windows that you find in an older house. Or is it like a warm quilt? This sketch is very peaceful to me - ordered, and tranquil. Funny that it was drawn during intense meetings. 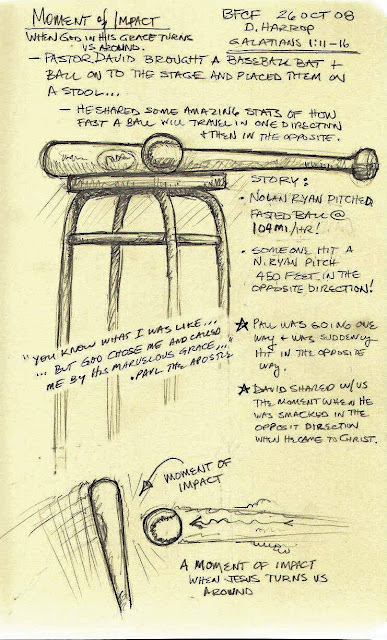 This is a sketch from today's sermon. I guess you had to be there - which this sketch is supposed to help with. 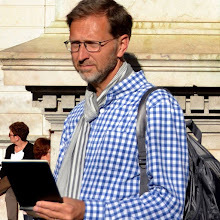 My theory is this: if you can make a related sketch while listening to a sermon, a message, a class lecture, you are FAR more likely to remember what was said AND to apply the central point to your life. Pastor David brought some props with him today. You can see them below. Click on the picture to understand the central message of his sermon. I was sitting beside some high school students this morning (my wife is in Canada at the moment). They noticed me drawing and tried to peek over my shoulder to see what I was doing. I seriously think they benefit from the creation of a visual representation of the message. I think they started to listen closer to the speaker with me. The students love to look through my sketchbook to see what I've done. It always surprises them. The Carmens were visiting in church today. 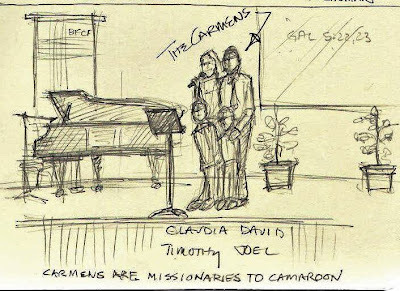 They are missionaries to Cameroon where David is a pilot. We love these people - they are old friends and we support them. This was an extremely fast sketch. I did it while they stood and spoke. I think I captured little Timothy and Joel - they way they were standing - leaning into their parents. Obviously, this was done in pencil. I wish I could draw people better - especially faces. I need to take a course one of these days. Today's message: "Too good to be true!" 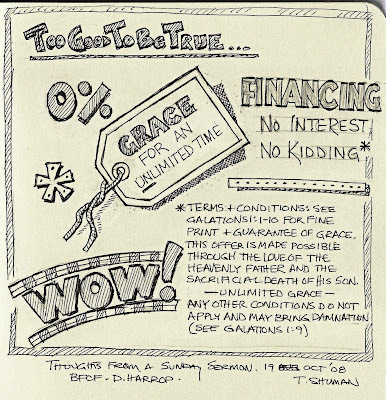 As Pastor David Harrop spoke from Galatians 1 on the topic of GRACE this morning, this is the picture that came to mind. I was reminded of the mountains of ads you get with your Sunday paper in the US that yell for your attention. Here's an ad that really tells the truth. I especially like the "fine print" with this ad. Check it out. You can click on my sketch for a larger version. While we are at it... what about those literal mountains of paper ads? This doesn't happen here in Europe. Yes, we get paper ads in our mailbox, but nothing, NOTHING, like in the U.S. 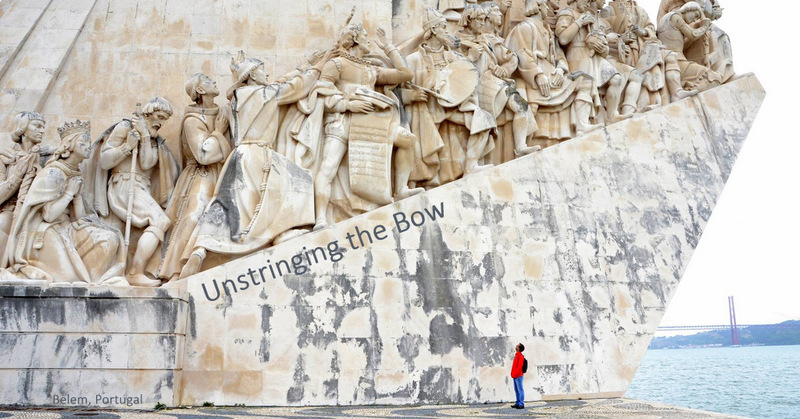 If we are serious about doing something to consume less - this would be a great place to start. Sorry for getting off track. We were in Florence the other day with the senior class on their class trip. 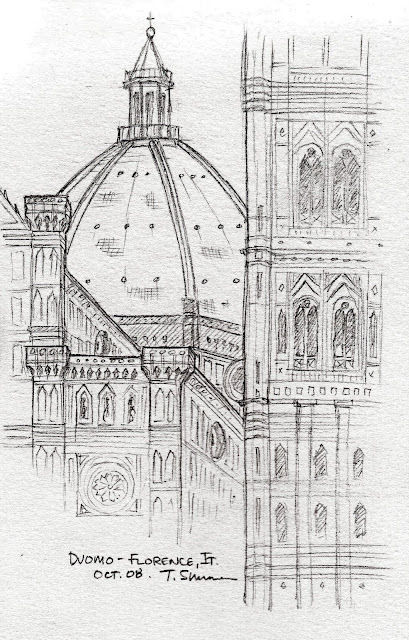 When you are in Italy you can't help but feel like drawing. So that's what I did. This Duomo, (domed Cathedral) is quite beautiful. Michaelangelo designed this dome. This sketch is done in pencil. I usually draw using a fine tipped pen. This time I used pencil thinking that I might do some watercolor later. I found that I enjoyed working with pencil. It's easy to add tone and make quick adjustments. I might do more. This was done in my new Moleskine watercolor sketchbook. Nice paper. This sketch was done last Sunday, October 5 (oops, I wrote Sept on the sketch). 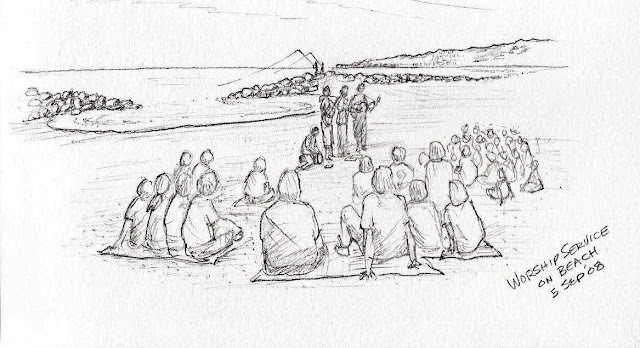 This is a sketch of the worship service that the seniors lead during their class trip to Rome. The music was great, the speaker, one of the students, was also very good. Naturally, the view was really cool too. There were approximately 90 of us. We just got back from Italy with our senior class - 79 students. Here are a couple of quick sketches I did last night at a concert all of us attended. The concert featured Vivaldi's Four Seasons. It was amazing. 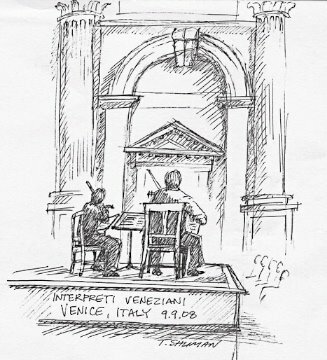 The sketch below had to be fast so I was unable to include the other six members of the string ensemble called, "Interpreti Veneziani". This view was drawn from my seat on the front row to the extreme left of the stage. These guys are amazing, see the one minute video we took below for a sample. This little sketch was also done during the concert. Interpreti Veneziana holds there concerts in a former church. There are several statues in various spots inside. This particular sculpture was interesting because it featured a vail over the woman's face. How is it possible to depict a vail in stone? Well, the artist did it quite nicely. Thanks Ginny for inspiring me to do some sketches. The paper you gave me was just what I needed.